Above is a painting done by Leia Bell, she seems pretty cool. After graduating with a BFA in Printmaking she had no clue what to do with it, so she began silk screening posters for a local music venue and it all fell into place from there. Her website consists of silk screened prints, paintings, and drawings. When looking through her art I noticed much of her work consisted of bright colors until I saw the painting above which stood out to me with its dark earthy tone. 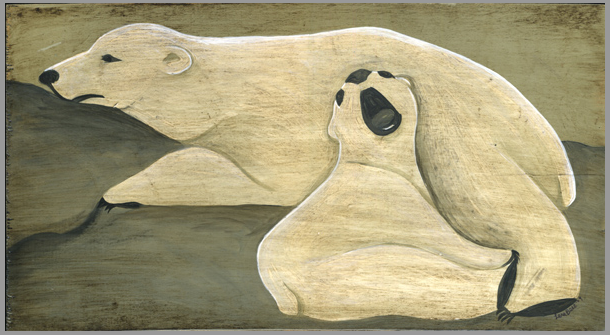 Also, the underlying factor of two bears resting was part of the motivational reason to show this painting.